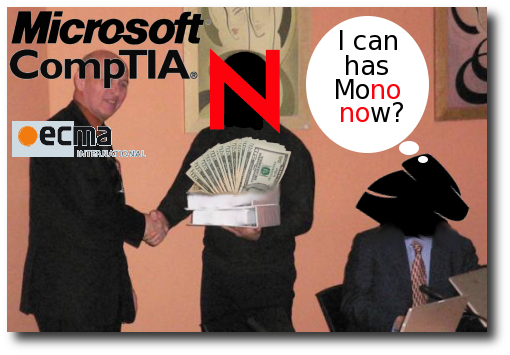 Forum » News / Front-page » Microsoft, CompTIA, Novell, ECMA and others members of the "Ecosystem"
BoycottNovell has a right vision of the Microsoft ecosystem. Lure as many developers into building useful apps (or the entire car) with Microsoft-technology. You cannot implement OOXML without Microsoft dependencies, whether they are legal (FRAND patent license) or technical (WMV files in an OOXML document). Re: Microsoft, CompTIA, Novell, ECMA and others members of the "Ecosystem"
The term "ecosystem" is obviously considered a good metaphor by MS marketing, but I have always wondered how anyone could be happy with being a part of "Microsoft's ecosystem". It is a simple and inflexible food chain with MS at the top and everyone else being food for someone. For a long time, the end users at the bottom of the chain have been playing the role of stupid, complacent cattle, but they are definitely getting smarter. Once the cattle start thinking for themselves and stop being easy prey, the chain fails all the way up to the top. - Hey, there's free vegetarian food over here. It tastes great, and there's enough of it for everyone! - No thanks, I'd rather gnaw on the bones of this long dead antelope. - Suit yourself. I'm definitely going vegetarian, it's a lot nicer over here. Come on, everybody! - Hey, you guys are part of my ecosystem. Come back here so I can eat you! I don't understand the image. Roy is known for slanderous communication, unless he backs it by good analysis it sounds pathetic.